Aboriginal protesters who set up camp at Doug Jennings Park at The Spit for the duration of the 2018 Commonwealth Games were staking a claim. When the camp — known as Camp Freedom — was made, campers brought with them years of history, memories of oppression, and a proud activist legacy. And the attention of 10,000 police and private security guards. A makeshift campsite with facilities to rival that of permanent campgrounds, Camp Freedom and its members protesting the ‘Stolenwealth Games’ stood in Doug Jennings Park for two weeks, despite what the weather and the security enforcers threw at them. 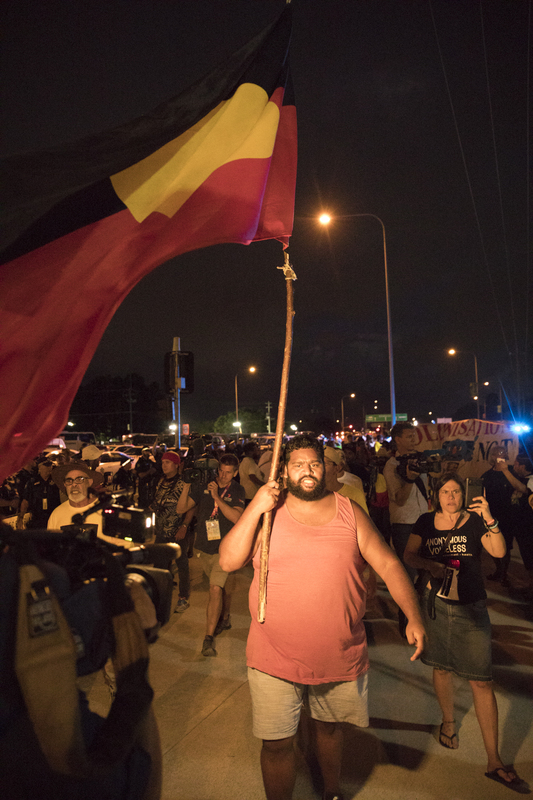 Indigenous activists and their allies came from all over Australia to the park for the duration of the 2018 Commonwealth Games, determined to highlight the issues of Indigenous Australia on the world stage. And they evoked the legacy of their 1982 Commonwealth Games counterparts who took on the infamous Bjelke-Petersen regime. Walking into Camp Freedom as an aspiring young journalist, I had no idea what to expect. But myself and photographer Dylan Crawford were greeted with warmth, smiles, and were asked if we’d eaten yet. Because I was a journalist, the protesters were wary of me. But as a person who was there to listen and learn, they were happy for me to be there. Included in everything, we were treated as part of the camp. I had communicated with organiser Ruby Wharton before the camp began, and was surprised to find that she was a uni student, and the same age as me. A staunch activist, Ruby took over the reigns from her father, Wayne ‘Coco’ Wharton, an activist who protested at the 1982 Commonwealth Games, and led the Musgrave Park tent embassy for a number of years. Boe Spearim is another rising leader, and was a key member of the Brisbane tent embassy. Though he appears intimidating, Boe is warm and kind, caring about everyone in camp and does his best to ensure everyone’s safety and well-being. Along with many other key millennial activists, Ruby and Boe kept a presence throughout the Commonwealth Games, bringing awareness to many of the same issues their parents and family protested about in 1982. Dale Ruska, a Goenpul man from nearby Minjerribah and a long-time campaigner for Aboriginal land rights declared the group’s Statement of Reason. “What we’re calling on as one of our main objectives, is a Historical Truth Commission in relation to this country Australia,” he said. Police had firmly said they did not want the protests to be like 1982, when Brisbane lived in a State of Emergency, declared by then-Premier Joh Bjelke-Petersen two weeks prior to the Games. Still, despite the police service’s more accommodating approach to the 2018 protesters there were seven arrests of Indigenous protesters during the Games, a small number in comparison with the more-than 400 arrests during the 1982 Games protests. Police grew concerned the day of the Opening Ceremony, when protesters sat on the road outside their campsite, preventing the Queen’s Baton Relay from coming through the Spit. Coco Wharton showed the group was happy to negotiate with authorities when they agreed to let a bus carrying the baton bearers, including a young disabled boy, through their blockade. 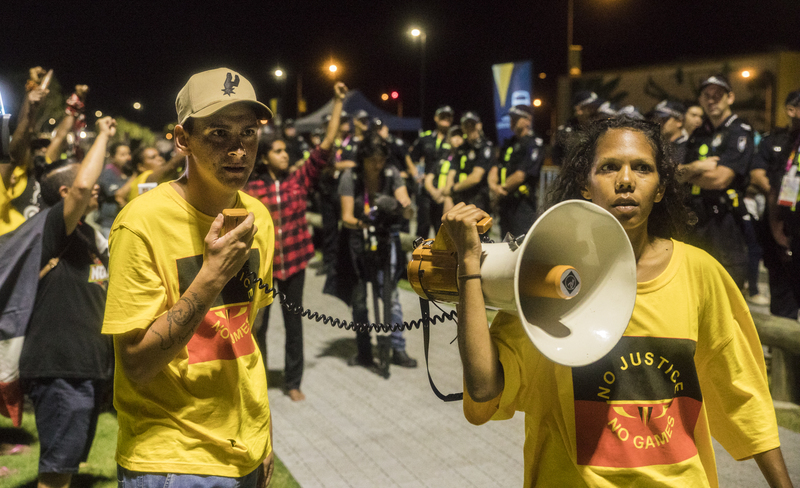 That night, across from Carrara Stadium, 70 protesters met more than 150 police as they marched around the stadium during the Opening Ceremony to soccer fields behind the stadium. Rehearsal for Commonwealth Games Opening Ceremony Australia. Photo: Cathy Ross. 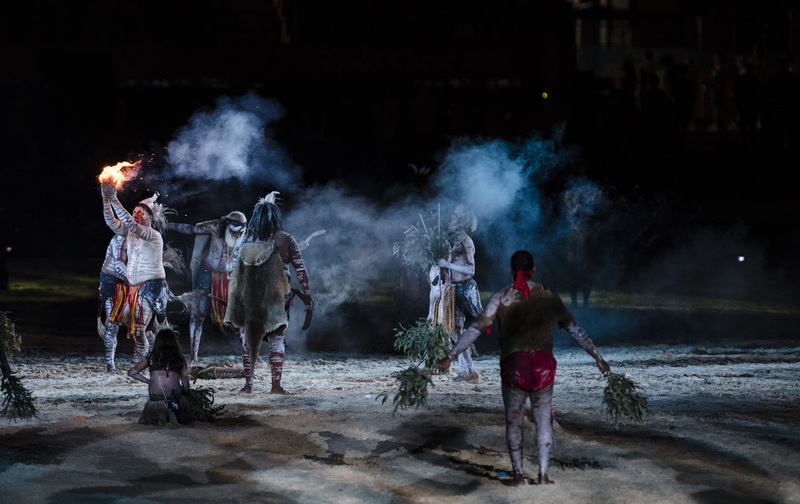 As this happened, inside the stadium Indigenous Australians performed traditional dances for the opening ceremony. 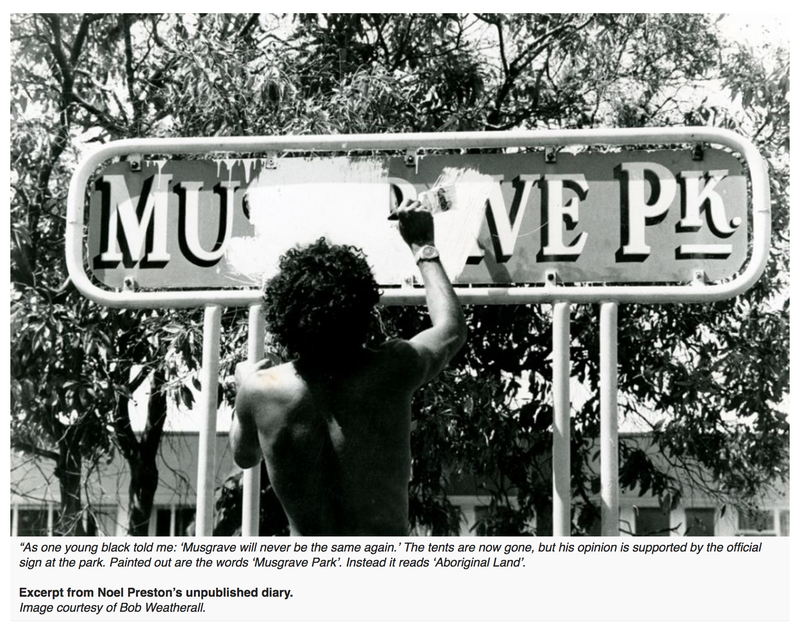 Brisbane-based Indigenous university lecturer Eddie Synot wrote at the time: “The juxtaposition of these two events [the Opening Ceremony and protests outside]…leaves me with a jarring feeling perfectly described by the Uluru Statement from the Heart as ‘the torment of our powerlessness’. “Those taking part in the official ceremony should not be considered to have been duped, any more than those protesting should be viewed as fringe radicals. These are different representations of Indigeneity,” he wrote. The first arrests were made this night, when a delegation of 10 activists was told they could enter the stadium, only to be stopped at security where a scuffle broke out. Ruby Wharton, Meg Rodaughan, and Dylan Voller, a former inmate at the infamous Don Dale Youth Detention Centre, were arrested and later charged with public nuisance. They were released on bail the next morning, on the conditions that they could not be near any of the Commonwealth Games Major Event Areas (MEA). Camp Freedom continued their peaceful actions daily, choosing places where they would make the most impact and gain the most attention, particularly from international communities. They invited politicians to come to their campsite and to speak with them about their push for a Historical Truth Commission, calling on Prince Charles on many occasions to visit and talk with them. “You tell Prince Charles to come, to see our people. We are the sovereign owners,” said local Yugambeh leader Pat Leavy outside the opening ceremony. Early in the Games, the group protested outside Prince Charles’ hotel, hoping to catch his attention with banners and flags. A delegation of Gwenda Stanley, Uncle Dale Ruska, Dylan Voller, and Ruby Wharton met with Commonwealth Games Chair Peter Beattie, to ask for his support. Dylan Voller clarified the group’s intentions throughout the Commonwealth Games to Mr Beattie. “A message for the Commonwealth Games — we’re not here to cause trouble or have violence, we’re here for peace,” he said. “As you can see there’s a lot more police than the other night, they’re the ones that are coming down with violence. Channel 7’s morning show Sunrise was a target for some of the group’s actions, as they filmed live from a stage at Broadbeach. Sunrise came under fire after a controversial panel featuring host Samantha Armytage, in which conservative shock jock Prue MacSween advocated for another Stolen Generation. “Just like the first Stolen Generation, where a lot of children were taken because it was for their well-being, we need to do it again…” she said in the panel a few weeks before the Games began. The broadcast is now being investigated by regulator the Australian Communications and Media Authority. Before targeting the Sunrise program, the group woke early, playing songs into a megaphone as a wake up call, and children and elders travelled to Kurrawa Beach where they held signs and chanted, referring to the show as ‘scumrise’ and ‘sunlies’. Yelling herself hoarse, young activist Lucy Reynolds told the group that they couldn’t be seen by the cameras due to the positioning of the stage, but they could be heard. It led to a difficult on-air exchange on Sunrise. The next day the activists formed a media team, and released Camp Freedom’s first official media release, the Statement of Reason. They went to large local shopping centre Australia Fair, marching through the centre with banners, chanting, and using clapping sticks until they reached Scarborough Road where they spread out, blocking the road and tram tracks. “We want the truth to prevail, we want the truth to be known, and if Australia has a conscience they’ll want to know the truth too,” Uncle Dale Ruska told the gathered protesters and growing crowds. Gwenda Stanley addressed the Queensland Police Service directly, comparing them to police force used during the Frontier Wars. “These people in the blue and the black here today, you are no better than those before you,” she said. “You serve a Queen who thinks she is sovereign of this part of our country, of this Commonwealth that she calls hers. The crowd cheered as Gwenda yelled into the megaphone. Back outside the shopping centre, the group marched as one toward their bus in a nearby carpark. When police formed a wall, telling protesters they needed to cross the road, things got heated. Crossing the road would result in instant arrest for breach of bail for Ruby, Dylan and Meg and the group was determined to stick together. After a conversation with negotiators, the group was allowed to move further down the road, where they were to wait for the bus to drive in and pick them up. After this protest, something changed — for Camp Freedom, and for the authorities. The camp had paid for a permit from the Gold Coast Waterways department to camp at Doug Jennings Park, but it had only been for one week — the maximum allowed. This permit had expired, and an application for a new permit for the next week had not been processed, leaving the camp’s legal status in question. Camp Freedom, which had been a place of relaxation and peace, a temporary home, now became a defence base for the Indigenous protesters. The police presence was heightened and constant. The sense of fun had left camp, though people still sang and played guitar and children still ran around playing football and cricket. They now did this in closer quarters, moving in, with tents and caravans surrounding the group on all sides. They went ahead with planned actions, determined to keep the world’s eyes on them, although now most children and elders stayed behind at the camp. On Friday the 13th, the group decided to protest Sunrise again. But they met with an empty stage; hosts Sam and Kochie had run to a ‘secret’ location. 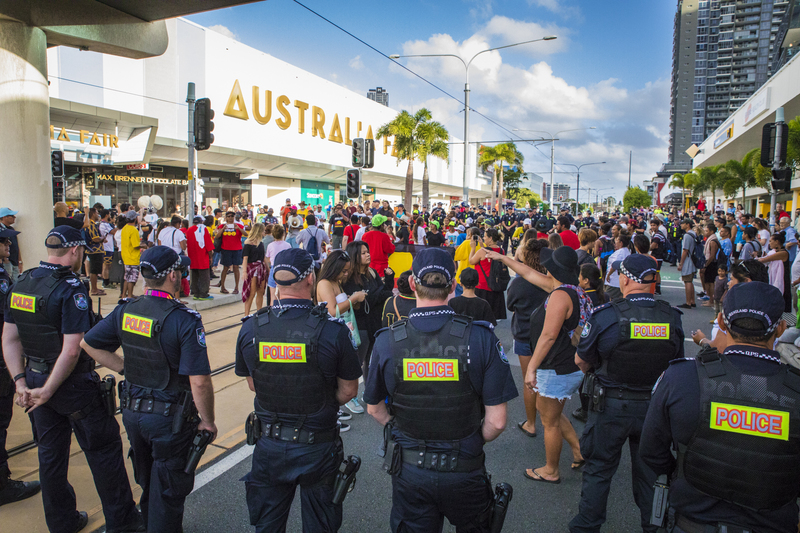 Protesters then marched through Festival 2018 grounds on Kurrawa Park, and into Broadbeach Mall. They stood in the mall, chanting and making speeches for a short time, before hitting a wall of police officers. The group of approximately 40 protesters was stopped by roughly the same number of police officers, wearing bulletproof vests and forming three unbreakable lines. An investigator told the group they would have to turn back and leave the mall. Slowly but surely, chaos ensued. The group stood still, as staunch as the police they faced, when Uncle Coco laid down on the ground in front of police. Usually an open and willing negotiator, this action changed the vibe for the protesters. He was joined by Uncle Ydo, Uncle Shaun Sandow, and Kane Rain. Police began to march forward, pushing protesters back. They gathered the men who had sat down and arrested them. A woman, Debbi Jones, was knocked to the ground, and a disability meant she struggled to get up. She told police she was disabled, and to give her space to get up and move away. After the police had dragged Mrs Jones while continuing to move forward, they began pushing and shoving to move protesters, who began to back up, arms above their heads, chanting “don’t shoot”. They made their way back to Kurrawa Park where they stopped briefly for some impromptu speeches, before leaving for Camp Freedom. It was then the camp found out that Dylan Voller had been rearrested. Despite advice from members of the group, Dylan had come with them on the bus that morning, wanting to join in the protest. But the proximity to Festival 2018 meant Dylan had breached his bail condition, and he was arrested as soon as police saw him at Festival 2018. But he had not been taken to Southport watch-house, as the men arrested at the protest were; he was taken to the University Hospital. According to police reports, he had attempted to harm himself in the back of the police van, and was taken in as a precaution. Lawyers that had been staying at camp went to the watch-house, and helped organise lawyers to get the men from the watch-house out on bail, as well as Debbi Jones and Dylan Voller, who were in hospital. The men, including Dylan, were released on bail late that afternoon, and banned from returning to Camp Freedom. Debbi Jones was released from hospital without charge. This was the second march in as many days that the authorities had been unaware of, and the police were afraid of what could happen. So were the protesters. At a press conference that same day, Queensland Police denied the use of excessive force during the Broadbeach Mall action, and released a statement saying that Debbi Jones’ injuries, and that of another woman treated at the scene, were not due to direct police actions. Meetings were held to update the campers on everything as new information came in, regarding arrests, their presence at the camp, now without a permit, and the police actions. There was an increasing fear about their precarious position, but they were determined to continue. The next morning, Ruby Wharton was driving her car with her cousin, and Dylan Voller, at Elanora when they were faced with a road closure on the Gold Coast highway, and directed by police into a detour. They had unwittingly stumbled across the road cycling race, a temporary MEA. When they turned onto the detour, police pulled them over, and arrested Dylan and Ruby for breach of bail. This was Dylan’s second arrest in 24 hours. As this happened, Camp Freedom was under siege. The Waterways Department had come to move the campers on, as their permit had expired five days before and they still showed no signs of leaving. With them, Waterways brought the Department of Children’s Services (DOCS), the Department of Health, police negotiators, police liaisons, plainclothes officers, and fully armed officers, carrying both tasers and guns. The carpark held a van labeled as a ‘mobile police unit’, as well as two police vans, and a plain white paddy wagon with eight individual cell doors. A car park nearby, on Seaworld Drive held two more of these paddy wagons, and more police vans. DOCS and the Health Department inspected the campsite, looking for breaches of child safety and health. They inspected the kitchen, and port-a-loos, as well as filming inside caravans and tents. After a tense standoff, all officials except for Police Liaisons left the campground. The camp remained huddled, hushed meetings were held between Elders, and the children were kept close and quiet, while everyone waited. Passionflower essence, a natural medication, was given out to those who were upset, to calm them down. Expecting the return of authorities, and fearful of their own incarceration, the group waited the day out and while some families prepared to leave, others from around Australia made tracks to get to the camp, and show their support. The next day was the day of the Closing Ceremony, and while the fear of the day before was not gone, Camp Freedom looked forward. A meeting decided to head to the park opposite Carrara Stadium, where they had gathered 10 days earlier for the Opening Ceremony. At Carrara, the 70-strong group was meet by only 100 police officers. The group climbed trees, trying to hang an Indigenous flag measuring 25 by 30 metres. Twelve members prepared to enter the stadium with tickets they had purchased earlier. The twelve spoke with police officers and asked if they could wear their ochre inside the stadium which was approved. But despite working with negotiators, and holding tickets bought earlier that day, the group was held up at the entrance and searched repeatedly, before waiting outside to be allowed to enter for almost an hour. After a number of speeches, finally eight-year-old Justice Reign spoke, addressing police officers. “I’m up here standing with my foot on my land, and you shouldn’t be putting your foot on my land, you don’t own it,” he said. The protesters left to return to Camp Freedom, and to continue a tradition of fighting for acknowledgement of sovereignty, never ceded. As they always have done. *Updated: Location of Camp Freedom changed from Broadbeach to Doug Jennings Park at The Spit.